The new Olympia Leisure Centre opened in January 2017. The completion of new external sport and leisure facilities followed in June 2018. £21.75 million has been invested at Olympia as part of a £105m investment to transform our leisure services over the next decade. 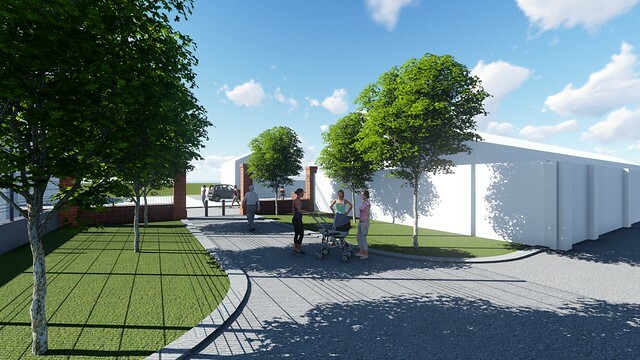 In addition, a new tree-lined boulevard was created to lead to the new centre from Boucher Road and a new pedestrian entrance, known as the ‘John Stewart Bell entrance’ was created off Olympia Drive. We are currently asking you to vote for your favourite name for the new road that leads from Boucher Road to Olympia Leisure Centre. Find out more. Find out more about consultation activity around Olympia. This project was funded by the Belfast City Council and a contribution from the Department for Culture, Arts and Leisure. Watch our virtual fly-through video of the new Olympia leisure facility.